So I found out that it leaked around 2 days ago. I'm actually sad by this. Jesse has worked so hard and he still is on this album. I know us fans will buy the album when it actually comes out. We will support Jesse and his music. Hobbies : I live for music!! I love to read and write, hang out with friends, and watch movies! Unfortunately, it's people who feel that something is owed to them for waiting so long for it. And on top of the waiting, not ever hearing anything more about it from him or his team. Just the sad people that are sad and truly disappointed with their life so the have to bring someone else down too to try to make themselves feel better. Sadly, since he is still working on it, I feel(and can honestly see this) like because of the entire album being leaked, that he'll change the whole thing. And I couldn't blame him if he does really, because when it's just a song or two leaked that's somewhat fine because the integrity of the rest of the album and all the work put into it is still there. But now, this, strips that away, and makes you just think "What's the point? Why release it when people have been and can get it for free now?" And of course, I don't want him to scrap it all and start over, since we have already been waiting for so long, but I'll completely and honestly understand him and why he did so, if he does decided to do just that. babygirl49392 wrote: Unfortunately, it's people who feel that something is owed to them for waiting so long for it. And on top of the waiting, not ever hearing anything more about it from him or his team. Just the sad people that are sad and truly disappointed with their life so the have to bring someone else down too to try to make themselves feel better. I see where you are coming from. Well the album is only a few months away from being released so hopefully he won't scrap the whole thing. Jesse is putting more songs on the album so hopefully they won't leak and then 'Have It All' gets released for real it will do better because of the added songs. But yes this is sad and I feel for Jesse. I wonder if he knows? I also like Undo :-) it's very slow and it's sung very high. but it sounds AWESOME. I also like I don't normally do this, there's also a girls voice in it. "Boy you know I like but I don't normally do this", sounds so good. A song that surprised me was Seasons (My love will never change). It sounds a thousand times better than live (although I think that he did an amazing job performing it live). It sounds just so good, and also the music. The only song I listened to was The Writer and I love it!! Jesse's voice is amazing on it!! exactly! 3 damn years of waiting! i couldn't resist not to listen to it either but i don't think that makes me any less of a fan than others. also, i'm glad he decided to add more songs to this album because 11 songs aren't enough for an album if you ask me, not to mention that we already knew more than half of them. over all as you said it's a good album but it could've been better...and i think that the real album will be better than what we already listened. departure is still my favorite too and i don't know if he will ever top that...as for the party record, well, he did say he's gonna add some songs with a more "deep"meaning (i don't even wanna imagine him singing about peace and love and hugs and kisses like eden would have wrote the songs instead of him) but i'm sure the songs will sound great even if the lyrics will be...weird. oh and the writer and mrs mistake are definitely about katie even if he didn't write them, he probably came with the idea. and i don't normally do this, i think she likes me and probably undo are about jasmine. As long as we album the album when it actually comes out, its cool!! And I don't think it makes us less of a fan. We've waited 3 years for this!!! I will support Jesse now and forever!!! 100%!!!! "The Writer" is the best song on the album, really one of the best he's ever recorded! I love 10 of the 11 songs. I can't get into "I Don't Normally Do This", the other singers on it just ruin it for me. "Undo" is awesome, very Timberlake! Now I do love "I Think she likes me" and have since I saw him live at the KissMass Christmas show in Dec 2010 here in Charlotte. I really wish he'd of just released this album as is, cause it is that good. Then in 2012 he could be releasing the follow up to it! He had some clear radio hits in waiting (Writer, Club Hop, Have it All). I feel honestly he just wasted precious time in his career by not releasing this album while other new stars have emerged in his absence making it all the harder for him to make a true comeback. This was a big mistake on Jesse's part and I just hope he can recover from it. "Have it All" could have easily stood up with the quality of his previous 3 albums without changing a thing. We could be getting a 5th album in 2012 now we are waiting on a 4th album after a 4 year absence. I feel fans were owed that leak and I'm glad it happened and will teach Jesse never to do something like this again in his career. There was no excuse to delay the album like he did, it is fine the way it is. I know we're all enjoying the fact that we get to hear the original tacklist for the album, but we need to get one thing straight. For those saying that we were Jesse owed this album or these songs to us...WRONG! Jesse doesn't owe us ANYTHING. Jesse doesn't have to make music at all. He can be a chef, director, producer, actor, or just a songwriter. He didn't have to spinoff into a solo career after Dream Street disbanded and make 3 amazing and successful albums for the world to enjoy. He doesn't have to tour around the world doing concerts, have fan Meet & Greets, sign autographs, make TV appearances, or do radio interviews. He does this because he chooses to do something that he loves and let the world know of his talents. Yeah we're his long time supporting fans and we feel that we deserve music; we practically DEMAND it. I believe that a lot of us JMACkers expect SO MUCH from him that he just overworks himself way past his limit to give us what we want. He really shouldn't have to do that because that would add even MORE stress and weight that he shouldn't have to bear. We should all treat every album/single he releases as a Christmas present: whether we like it or not, at the end of the day, we must be grateful for what we received and be grateful that we were given it in the first place. I see a lot of us having inexcusably high expectations and unnecessary demands for him lately. We really need to bring our heads back down to size and be humble. 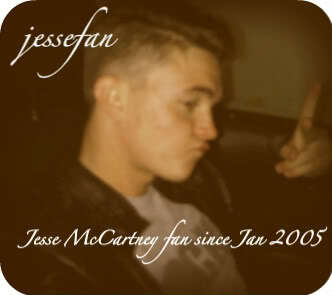 God gifted the world with Jesse McCartney and we can't abuse it. She should've been my Mrs.
JesseMAC22 wrote: I know we're all enjoying the fact that we get to hear the original tacklist for the album, but we need to get one thing straight. For those saying that we were Jesse owed this album or these songs to us...WRONG! Jesse doesn't owe us ANYTHING. Jesse doesn't have to make music at all. He can be a chef, director, producer, actor, or just a songwriter. He didn't have to spinoff into a solo career after Dream Street disbanded and make 3 amazing and successful albums for the world to enjoy. He doesn't have to tour around the world doing concerts, have fan Meet & Greets, sign autographs, make TV appearances, or do radio interviews. He does this because he chooses to do something that he loves and let the world know of his talents. Yeah we're his long time supporting fans and we feel that we deserve music; we practically DEMAND it. I believe that a lot of us JMACkers expect SO MUCH from him that he just overworks himself way past his limit to give us what we want. He really shouldn't have to do that because that would add even MORE stress and weight that he shouldn't have to bear. We should all treat every album/single he releases as a Christmas present: whether we like it or not, at the end of the day, we must be grateful for what we received and be grateful that we were given it in the first place. I see a lot of us having inexcusably high expectations and unnecessary demands for him lately. We really need to bring our heads back down to size and be humble. God gifted the world with Jesse McCartney and we can't abuse it. Select a forum||--Jesse Related Topics| |--General| |--Jesse Photos| | |--Jesse Photos| | |--Concert/Meet&Greets| | |--Fan Made/WallPapers| | | |--Tour Dates| |--Fun For You| |--Contests| |--Poetry/Lyrics| |--Games/Trivia| |--Games| |--Trivia| |--Fan Fictions| |--Jesse Fics| |--Jesse Mature- 16 and older| |--Off Topic|--Introduce yourself.